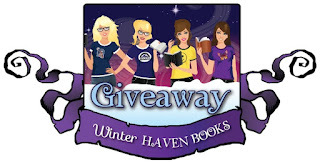 WinterHaven Books: Hauntingly Beautiful Covers Giveaway! To kick off our WinterHaven Hauntings Month with a blast, we're happy to announce a Ghoultastic Giveaway! As you'll see throughout the month of October, along with the winter season, Halloween happens to be one of our favorite times of the year. And, if you haven't noticed by our bookshelves and wishlists, Paranormal excitement is our brand of book entertainment. 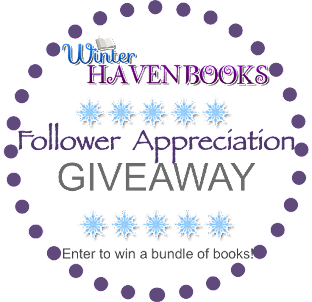 So, what better way to celebrate Halloween than to share our love of spooktacular reads with our followers than through an awesome giveaway. So be sure to fill out the rafflecopter to qualify to win the first 3 books in The Caster Chronicles series! Not only that - included in this prize pack will be a preorder for the fourth book! Oh and did we mention that the first book Beautiful Creatures is autographed by the authors?? =D All you have to do is enter, and be sure to share with us what spooky book is in your line-up to read this month? Good luck! If you haven't had a chance to check out the movie trailer for Beautiful Creatures, here's the YouTube vid to enjoy! I haven't heard of that one and I can't find it on Goodreads. Can you point me in the right direction please??? I really want to start the Girl of Nightmares series!! Good luck! Ten will be my spooky read this month, but I'm kinda scared to read it LOL! I've also been meaning to read these books because of the movie! The trailer was beautiful, thanks for the giveaway! I really want to read that one too! LOL I totally feel the same way, but it just sounds too good so I can't pass it up =D You are very welcome! Good luck! I haven't read that one! I will have to look into it =) You are very welcome good luck! I'M going to read Gena Showalter newest: Alice in Zombieland! Thanks! Yay I hope you like it! Good luck! I can't wait for Beautiful Redemption! Since it's Halloween this month, I hope to read a few spooky books. The Possession of Cassie Quinn, Anna Dressed in Blood, Girl of Nightmares, Little Star are a few. Oohh those all sound spooky!! I hope you enjoy them all! Good luck! You are very welcome!! I will have to look that one up too! I am loving all these spooky recs! Happy Halloween!! Girl of Nightmares for sure! Thanks for offering the giveaway! Awesome I hope you enjoy it! You are very welcome good luck!! Thanks! Oh yay I have that one to read too!! Good luck! Awesome! I hope you enjoy both!! Good luck! I am planning on reading Girl of Nightmares! I am getting ready to start reading Rapture by Phillip W. Simpson. I am just finishing up Last Bastion of the Living by Rhiannon Frater. I am dying to read a Rhiannon Frater book! I am going to try and make that a top priority in Nov =) I hope you enjoy your books! Anna Dressed in Blood, for sure. I want to read Rot & Ruin by J Maberry. Those are definitely on my must read list! You are very welcome! Good luck! LOL yay! You will be ready for the 4th book =) Good luck! It definitely does =) You are very welcome! Good luck! Oh I need to read that one soon! Good choice! Yay awesome choice! Good luck! Anna Dressed in Blood, maybe? Great Giveaway. Awesome! I hope you like it! Thanks! Good luck! I really want to read I Hunt Killers!! Great picks!! OMG that one puts the C in creepy!! Nice choice! Good luck! Hmm... I honestly don't have a spooky book lined up but I have been trying to figure out what one I should read. I really want to get into the Halloween spirit. I'm currently reading the Chicagoland Vampire series. I have been very curious about that one so you will have to let me know how you like it =) Good luck! I don't currently have a book lined up to read. Maybe I should read the first in the Caster Chronicles? I was bought the book a long time ago and I've always remembered the story and its unique narrative but I never managed to buy the rest! I am having the same problem with a lot of sequels coming out, I just don't have time! Thanks! Good luck! I really want to read Girl of Nightmares. The Diviners by Libba Bray. Super creepy. Awesome giveaway! Don't have any really spooky books lined up for this month yet, just currently finishing up Beautiful Creatures! Enshawdowed by Kelly Creagh. Why wouldn't anyone want to read a Edgar Allan Poe inspired book near Halloween? I'm thinking about reading Masque of the Red Death by Bethany Griffin after that:) Thanks so much for the chance to win! I loved Masque of Red Death! I need to read Enshadowed soon!! You are very welcome! Good luck! Vampire Kisses by Ellen Schreiber and Hourglass by Claudia Gray! I still need to read Vampire Kisses! I hope you enjoy both! Good luck! Thank you and thank you for the contest, too! Like a lot of people, The Diviners. I don't tend to read too many spooky books but there are some good suggestions in these comments! I can't wait to dive into that one!! I know my tbr is overflowing lol! Good luck! Hmmmm, I just realized that I don't yet have a spooky read lined up for this month. Totally unacceptable! However, I think I'll dive into The Hunted by Kristy Berridge. LOL that is! I haven't heard of that one before but if it is spooky then sign me up lol! Good luck! Among other things, I'm going through Forever by Maggie Stiefvater. Mostly on audiobook in the car! Awesome! I hope you are enjoying it =) Good luck! Hmm I will have to look that one up too! Good luck! Blood Like Poison, I am not sure how spooky it will be but it fits with the season. Vampires!! I have that one in my tbr and it looks really good! Good luck! LOL I totally feel the same way =D I can't wait to read that one too! Those all sound amazing!! Good luck! I have had Girl of Nightmares on the back burner because I'm nervous to read it!! LOL i know exactly how you feel! Good luck! I really need to read that one soon! Good luck! R.L. Stine has apparently written an adult spooktacular book. Iloves his goosebumps series, now I want to check out Red Rain. How did I not know this??!! I am definitely going to look into this! Good luck! Spooky book? I don't know if they're actually considered spooky but there's a good amount of paranormal books on my tbr list. For now I'll stick to reading some Goosebumps. R.L. Stine's books never get old. I'll try to find The Replacement by Brenna Yovanoff at my school's library. That cover is definitely on the spooky side! I loved R.L. Stine when I was younger =) Totally agree about the cover! It looks so creepy! Good luck! shadows by isla j. bick. :) i loved Ashes. I need to read those as well! Good luck! I just read Anna Dressed in Blood and am starting Ten and Alice in Zombieland this weekend! Thanks! Yay great picks! Good luck! Alice in Zombieland is on my tbr for this month. I am very excited to read that one too! Good luck! "Carnival of Souls" and "The Diviners" are both on my spooky reading list for October! I loved CoS! It was fantastic! I hope you enjoy both =) Good luck! Right now I'm reading The Name of the Star. Very creepy. Thanks! Just read Shadow Slayer after 13 on Halloween -- so good! I will have to look that one up!! Good luck! I'm planning on reading Anna Dressed in Blood. After reading my roomies review I have moved that one up on my tbr lol! Good luck! I'm going to read Velveteen!! I'm looking forward to reading The Replacement by Brenna Yovanoff! 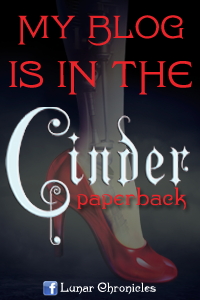 I am going to be reading Alice in Zombieland and Rose Madder.